The Academy Awards – it gives us anxiety just thinking about the controversy surrounding the prestigious film industry award ceremony. Normally associated with ground-breaking speeches and jaw-dropping ball-gowns, the past 2 years have been surrounded with the controversy of minorities being significantly excluded from all the major nomination categories, and women being excluded from the Best Director category. Yep, we’re talking about #OscarsSoWhite, and the fact that only one woman has ever won the Best Director award – Kathryn Bigelow, for ‘The Hurt Locker’. Now that the Oscars are over for another year, and Academy President Cheryl Boone Isaacs has promised to change up membership rules to ensure the same people aren’t voting year after year, there’s another aspect of the Oscars, and indeed the film industry in general, that still needs to be addressed. The way women are portrayed on screen, the types of roles on offer, and the complexities of such characters is an issue that is starting to be discussed in more ways than one. Female filmmakers are starting to recognize how important it is to create their own material, as writers, directors, producers and even financiers, in order to get more female-driven stories told from a decidedly female gaze. Why does this matter? Well, given that Hollywood is undoubtedly the most public industry in the world in terms of seeing a person’s work out in the open, what we see on screen has a massive influence in our lives, whether we like it or not. A recent survey from the Geena Davis Institute on Gender in Media and J. Walter Thompson Co., show that female role models in film and TV are hugely influential in driving women to improve their lives. They found that 90% of women globally feel that female role models in film or TV are important, 61% said female role models in film and TV have been influential in their lives and 58% said that women have been inspired to be more ambitious or assertive. The types of jobs or roles women have make a big difference. Geena Davis, commenting on the survey which involved 4,300 women in nine countries (Brazil, China, India Saudi Arabia, South Africa, Russia, Australia, the United Kingdom and the U.S.), said media images exert a powerful influence in creating and perpetuating our unconscious biases, and can also impact real life job decisions for women. “Media images can also have a very positive impact on our perceptions. In the time it takes to make a movie, we can change what the future looks like. 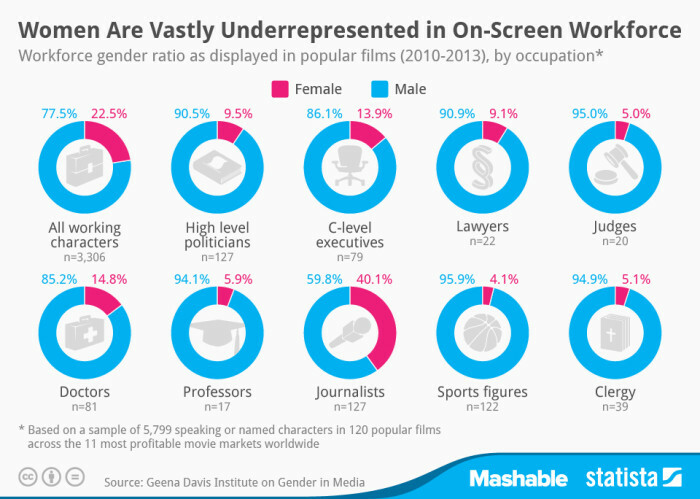 There are woefully few women CEOs in the world, but there can be lots of them onscreen. How do we encourage a lot more girls to aspire to lead? By casting droves of women in [science, technology engineering and mathematics], politics, law and other professions today in movies,” she said. Fusion recently listed the top 5 professions of both the Best Actress and Best Actor winners since 1929 and found that for women, the number 1 role of winners was “wife”. For men, it was “criminal”. In sequential order, the rest of the list of professions for women were entertainer, widow, blue collar/service worker, socialite/heiress, and no. was a prostitute. For men, it was military, entertainer, arts/literature, and royalty/nobility. Hmm, do we even need to point out the obvious different and bias between the two lists? “At the Oscars, women have been consistently rewarded for portraying characters who conform to traditional gender roles. And when they do work outside the home, they’re often limited to blue collar jobs like waitress and housekeeper. 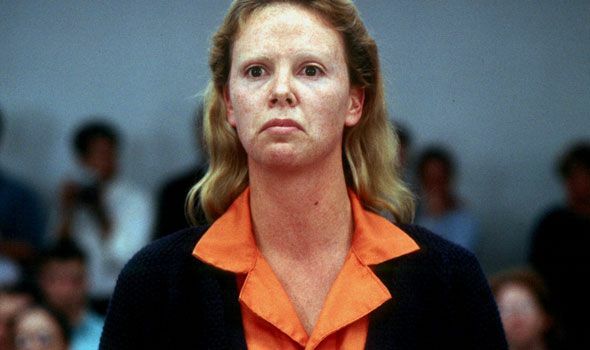 No Best Actress winners have won for playing military members or journalists, occupations that account for 10 and three Best Actors, respectively. Likewise, no Best Actors have won for playing boyfriends or prostitutes, though there are two girlfriends and six prostitutes in the annals of Best Actresses,” writes Molly Fitzpatrick. Back in 2014, popular industry blog Women and Hollywood on Indiewire published a piece titled ‘Stand By Your Man‘ outlining just how important and popular the role of “wife” is in order to win the Best Actress or Best Supporting Actress awards for women. It is becoming clear how well-known and obvious this factor is. UK online job search company Adzuna examined 338 winners of the Best Actor/Actress and Best Supporting Actor/Actress categories to find out what their jobs were. “Winners of the Best Actress or Best Supporting Actress award were more than twice as likely to play a character without a clear job than their male counterparts. 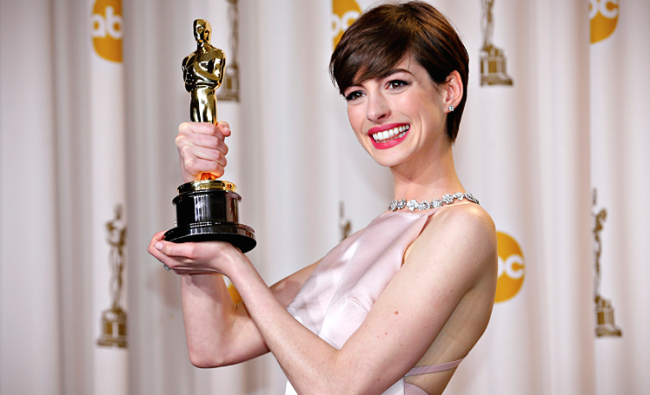 While in recent years a linguistics professor, Prime Minister and an interior designer have all been portrayed by Academy Award winning women, three of this year’s Best Actress nominees played characters that didn’t have jobs (all the Best Actor characters have jobs), wrote Stephen Pritchard. Between 1996-2015, one fifth of the Best Actress winners don’t appear to work at all, except for the role of Queen Elizabeth and UK’s first female Prime Minister Margaret Thatcher. Adzuna published an infographic to show the disparity broken down. If there has ever been a time for women to take up arms and write the types of characters they want to portray, as opposed to what the status quo determines, it is now. Let us be clear, there is NOTHING wrong with playing a wife, the problem is that when so many of the roles offered to women are a wife in a secondary or subsidiary manner to the importance of a plot, that’s when things need to change. All throughout history there are numerous stories of women (who were also wives and mothers and matriarchs) who changed the world and impacted peoples lives in a profound way. Unfortunately there is a systemic erasure of these stories from history texts, from school curriculums, in academia, and in the media. We need to start seeing women as complex, competent, interesting and different than the norms, in order to influence women’s choices in the real world away from the gender stereotypes.